Are you thinking about a doing a basement remodel, but aren’t quite sure where to start? Basements provide a bonus for homeowners looking to increase their space, so it is important that the proper planning go into the remodel. 1. Unlike a room addition, there is no need to excavate for new footings or worry about structural loads. 2. Utilities (including water, electricity, gas and sewer lines) are typically close at hand, further reducing costs. 3. Heating and cooling loads are relatively light for basements. 4. Basements almost always have stairs leading to them, unlike many attics (another popular house expansion candidate). Converting a basement, however, is not without its challenges. Below-grade spaces are subject to water and moisture, two common enemies of home construction. Mold and mildew are also common, and natural light is limited. Overhead pipes and ductwork can add further challenges, and if you didn’t anticipate a bathroom when the house was built, the basement toilet may have to flush up. 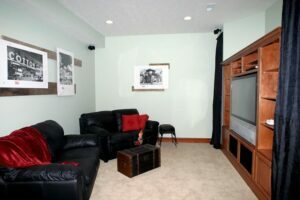 These are all things we can discuss with you when going over your basement remodel! These are all popular choices for basement spaces. Since we are lucky enough to live in an area where basements are a commonly built element of most homes, you may just be sitting on a myriad of abundant new living possibilities!